Let’s help babies who are teething. Please share this with family and friends whose baby may be going through this very uncomfortable stage. Is your baby over drooling? Is he or she getting more irritable than normal? Every baby experiences teething differently from the time their first set of teeth emerges to the types of symptoms they may have. So when does teething usually start? It really varies from one child to another. 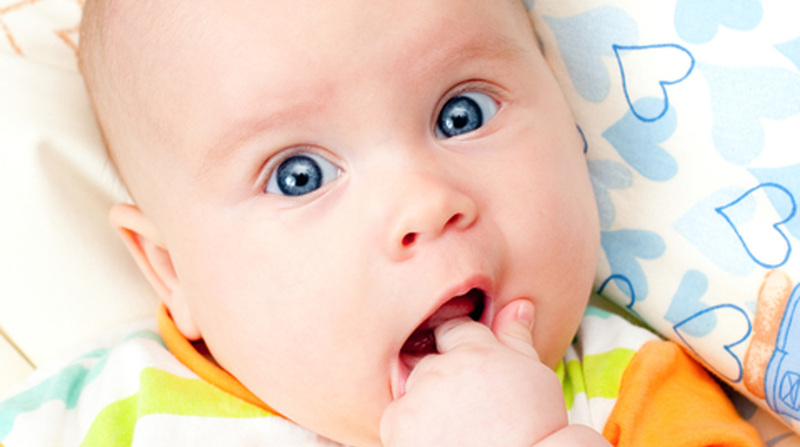 When it comes to symptoms, expect your baby to have various teething symptoms. Although the teething stage could be a very difficult time for your baby, you could help ease the pain. By being aware of the teething signs, you’d know how you could comfort your little one. Here are the 10 teething signs that you should look out for in your baby. To help relieve and ease the discomfort that your baby may be experiencing, your baby may be gnawing on anything and everything that he/she can get his/her hands on. Be it toys, the edge of the table, or the rail of the crib, everything is fair game to your baby. Teething rings can really come in very handy for your baby. When your baby is teething, drooling is a common occurrence as the body creates extra saliva to lubricate the tender gums. Drooling may also be worse with some babies than others. It’s definitely a good time to have bibs handy during your baby’s drooling stage. Do not be surprised when your baby does a lot of this … see next page.